There’s more to being published than writing a book. So, you’ve written a book. You’ve done the editing and the rewriting. It’s in the hands of a publisher. Job done. Right? Wrong. No, your job is about to take on whole new world. Welcome to marketing and publicity, the business end of the publishing industry. Perhaps in some Publishing Utopia you can just focus on your creativity, your artistic endeavour, but here on Planet Earth, it doesn’t work that way. Not if you do actually want to be published. I’m not going to get involved in self=publishing here, because I know nothing about it, but I suspect it’s no different. For the last few weeks I have been busy finessing the cover of my novel, The Wardrobe Girl. The artwork and ‘look’ was done in-house by Random Books Australia, briefed by my publisher, Bev Cousins. This included writing the back cover copy, my bio and finding the best filmic image to place the book in its world of a TV soap opera. The Front Cover was a very pleasant surprise, once I got my head around the pink typeface, I was delighted. If you’ve ever spoken to an author, or listened to an author at a writers’ festival, you may have heard the horror stories about covers they hate being imposed on them. But I loved that the girl in the image has an intelligent, curious, slightly cheeky expression and I loved the film set paraphernalia. It has the visual quality and feel of a film poster, which is perfect. Be ready, for a strange experience here – you will see your name on the cover of the book. It’s the most wonderful feeling of surreal disbelief and butterflies of joy. The back cover copy is so important too. Once the reader/buyer picks up your book because the cover is so wonderful, this could be their first introduction to your book and once they’re holding it you want them to keep a tight hold of it until they part with their cash and take it home to read. It needs to intrigue, pique the interest and reflect the tone/style of the novel. You don’t want them putting back on the shelf because they’ve decided it sounds to highbrow when a holiday read is what they’re after and vice-versa. This is surprisingly tricky to pull off, so be prepared and practise! I was lucky that the ‘shoutout line’ on the cover was perfect, so I didn’t need to worry about that. But again, be prepared. Your publisher may send through something you hate, or may need a bit of tweaking. 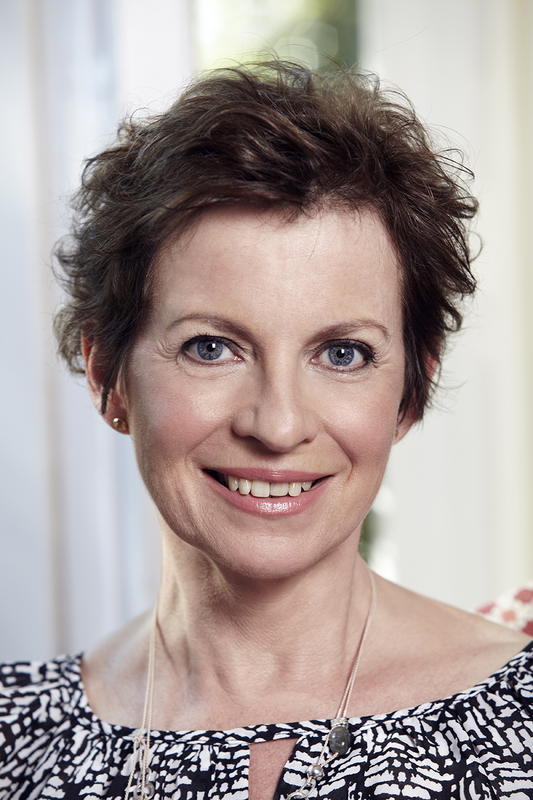 And of course the most psychologically damaging part of the whole exercise – the author shot. My book is very much a genre novel – chick-lit, to be precise. so my brief was ‘warm and inviting, friendly, big smile. I confess, I pulled out the big guns. I employed a professional photographer, the talented Angela Pelizzari, and make-up artist to the stars of TV, Trinity Raine. It was so worth it. they made the whole experience relaxing and comfortable. Don’t try to scrimp by here – your mugshot will be on the back cover of your book forever! And you don’t want to scare the punters away either. I sent off about half a dozen shots for Bev to choose and within a couple of days the finalised cover appeared in my inbox. there on the back cover was my photo! If I was excited seeing my name, it pales in comparison to the overwhelming reality check of me looking out from the back cover of the book. My book. It was about now I became a little teary. But that’s just the cover. I have created a Facebook Author Page and the hashtag #TheWardrobeGirl on Twitter and I’m helping design the Chapter Openers with my in-house editor, Anne Reilly. But the writing goes on. By the end of this month the copy edit will arrive and I’ll have a couple of weeks to work through that, before it’s returned for a final copy edit. And then it’s off to the printers by the end of December. Stay tuned, as they say, the next few months could be pretty hectic! PS this blog post is also a shameless piece of self-promotion for my book! 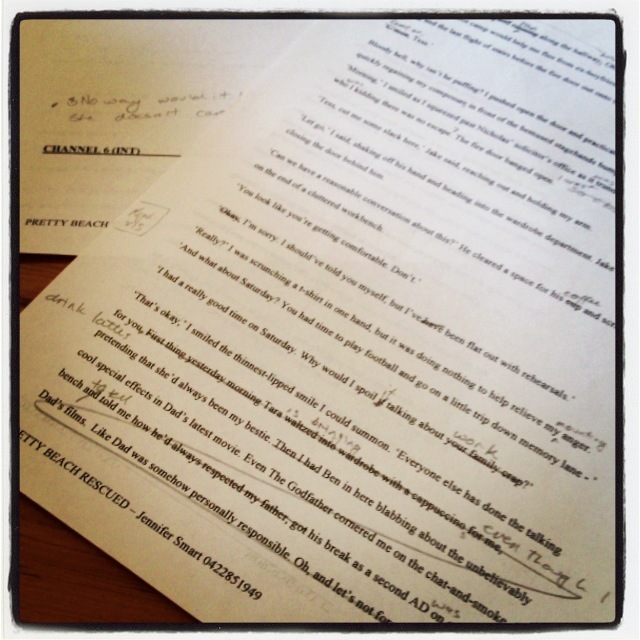 Revising The Revisions: Learning How To Edit. Novellist, Toni Jordan* describes writers as ‘Knitters or Quilters.’ There are the writers, like me who ‘cast on’ their story at Chapter 1 and then knit/write their way to the end, ‘casting off’ only when they have finished the last chapter. Conversely, the ‘quilters’, write/quilt pieces and then sew/write the pieces to form blocks and then piece together again to form a whole. 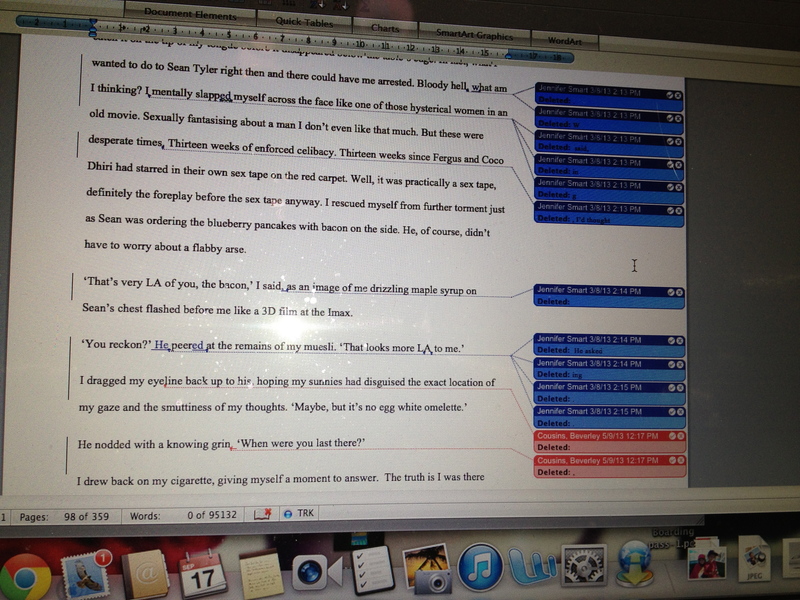 The editing process is mostly a quilting process. I quite like a bit of nanna technology and can often have a couple of knitting or quilting projects on the go, so this analogy made perfect sense to me. I realised, that for me, the art of editing was going be learning how to quilt as a writer. How to move pieces/passages around the manuscript, creating new pieces and then pulling it all together. But let’s go back a step. My publisher, Beverley Cousins at Random House, sent me through some very comprehensive notes about the manuscript – some general observations, detailed notes on particular scenes and points that needed clarification. She had also picked up typos, spelling and punctuation errors. This was all on a hard copy of the manuscript, marked up line by line, with an explanation of the squiggles she uses as shorthand. For the next 6 weeks or so, these documents were my Bible. I had a road map to follow and follow I did. Although I didn’t take on every suggestion, because there were some things I felt needed to stay. Now I could finally look at my work with fresh eyes. After the long process of writing, then rewriting and revising before I even submitted the manuscript, I’d reached a point where I’d fallen out of love with writing, my writing, my manuscript. I was re-energised. Yes, I was worried I might ruin the whole story, destroy all that work, but understand this: there is no rational basis for the terror that may descend at this point. all you can do is write through it. I know, it’s not fair. Some pages look like this. Other pages look more like this. The revisions bring tough decisions. Some ‘darlings’ are killed off. 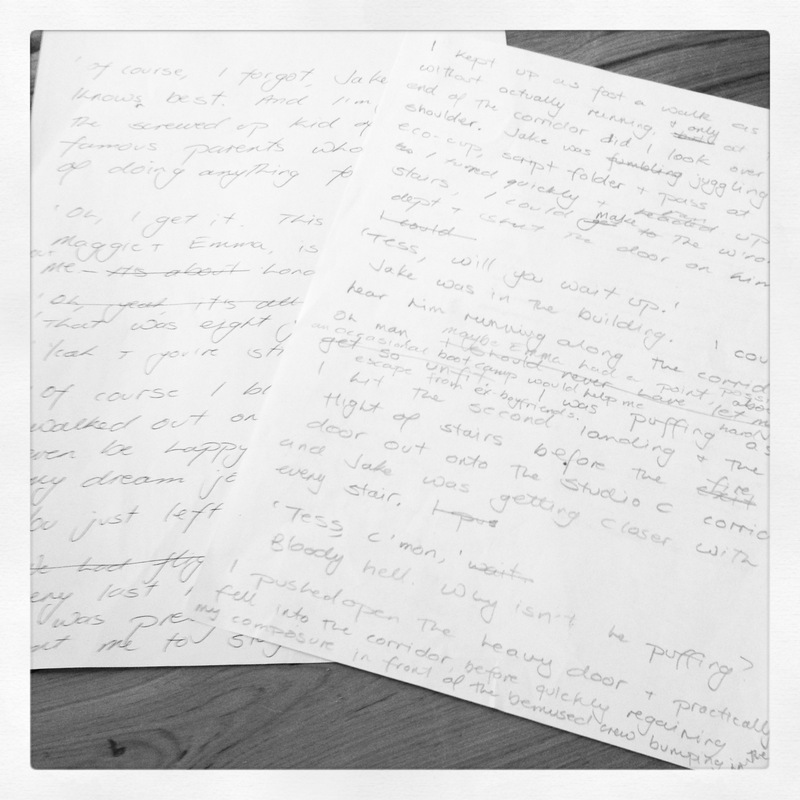 Lines you’d waited for, hunted for, scrawled out, rewritten and fought for, are sent to the editing room floor. Characters must earn their place in the story and if they don’t, so long. Other characters begin to play a role you never anticipated for them, or become more sympathetic. It’s hard to change your characters, even their names (one of my supporting cast had his name changed 3 times). I love all my characters, even the ones I disliked. They all talked to me and gave me ideas, when I was quiet enough to listen. Of course, some of the revision was ‘mechanical’. Correcting typos, punctuation, etc and that’s where I chose to start. I could do this straight onto the computer and it didn’t require a great deal of creative thought, but it did put me back in touch with the story. It allowed ideas to form and percolate. Eventually, you have to do the writing! I wish there was a secret formula for that, but I’m still searching. And perhaps this is another example of my love of nanna technology, now I reach for my pen and paper, or my Moleskine books. I head off to The State Library of NSW and I write. And then I rewrite the revisions. But there’s more. The next step is entering it into the computer and there’s always some tweaking and tinkering done there. That’s printed off, and a final edit with pen and paper is done. Eventually, I make it this far. 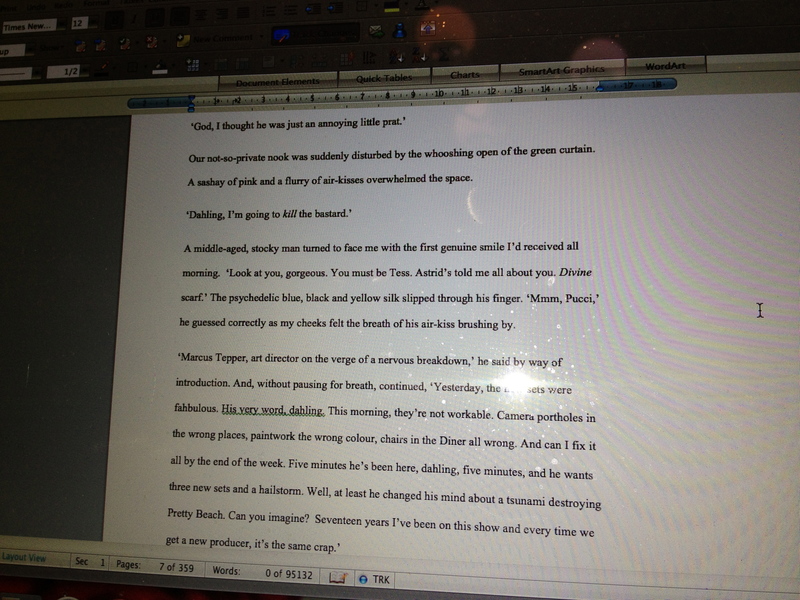 It’s not a quick process, but as Michael Crichton** says, ‘Books aren’t written, they’re rewritten’. Actually, I’m wrong. The most terrifying moment is opening the return email from your publisher. Fortunately, Bev loved my revisions. Now my manuscript is off to the copy-editor. I’ll let you know how that goes. **Michael Crichton was a best-selling author extaordinaire, Jurassic Park is just one of his many books and creator of one my all time favourite TV shows, ER. Click here for his official Website. All text is the property of Jennifer Smart.